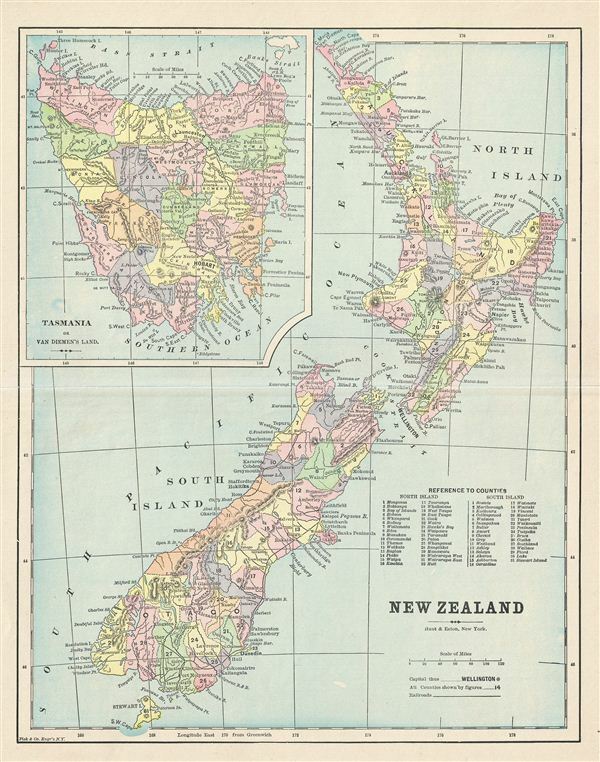 This is a fine example of the 1895 Hunt & eaton map of New Zealand. It covers the entire island country from Cape Reinga (C. Maria Van Diemen) to Stewart Island. An inset map in the upper left quadrant details Tasmania or Van Diemen's Land. Color coded according to counties, a list of counties is featured in the lower right quadrant. Created just two year after New Zealand became the first country in the world to grant voting rights to all women, it features various rivers, towns, cities, counties, railroads, and several other topographical details with relief shown by hachure. This map was published by Fisk & Co. in 1895. Very good. Minor wear on original centerfold. Blank on verso.